levallon Wrote: ------------------------------------------------------- > Mikey P. The "toilet bowl building," is also known > as Tycon Courthouse. 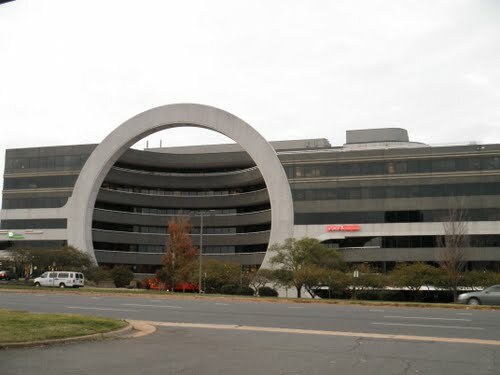 It was designed by a very > egotistical architect named Oscar Carlyle. The > next time you go by there, look at the flagstones > and you will see the letters "Oc" with the 'c' > smaller and to the right. > > I used to work at the Friday's that used to be > there and the building engineer told us the story. > There was never a court there -- just Friday's, > Hunan Lion, Dominion Bank and some security or > defense company on the top floor. I don't know > what's there now.